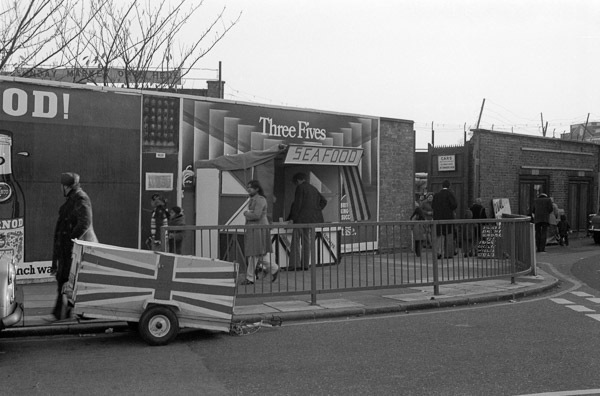 People at the entrance to the Sunday Market in the car park at the Oval Cricket ground, Kennington, with a 'Jellied Eel Stall for Prowns, Cockles Whelks and Winkles' in front a a cigarette advert that it seems to recede into - and it could be called 'Three Fives Seafood'. Three Fives, King Size cigarettes from 'State Express of London' do appear to have reached a new low in advertising originality and impact from what we can see of this billboard, and few could believe that anything with a name like 'State Express' was really from London. Although it did, though as Wikipedia explains the name suggested itself to London tobacco merchant Sir Albert Levy when he was a passenger on the Empire State Express which reached a world record 112.5 mph on a run from New York to Buffalo in 1893. He came home and trademarked State Express followed by any triple numbers, probably because the engine pulling the express was No. 999. The company brought out several different products using the trademark, including 'State Express 444' but only 'State Express 555' was truly successful. Albert Levy & Thomas based at La Casa de Habana (The House of Havana) in Leadenhall St became The Ardath Tobacco Company Limited in 1895. Ardath probably came from the title of a book by Marie Corelli, who got it from the Books of Esdras in the Apocrypha. Ardath had a large factory in Shoreditch. The company was sold in 1925 to British American Tobacco (later BAT) and Imperial Tobacco, the UK rights to '555' also going to BAT in 1961. By that time it had become widely sold around the world and is still a major brand in Asia, including China. I visited a student on work experience with BAT in the 1990s and was amused to find that their large office building was a no-smoking area.